Wassail all over the town! Charley was born in Brockweir in the Forest of Dean in 1909. He recalled that Wassailing was common around Brockweir sixty years ago, but thinks that the First World War may have ended the tradition. Bob Patten interviewed Charley in 1977 about his memories of the wassail traditions in the area. The recording is now held by the British Library. In Evesham on 21st December, St Thomas Day, locals recall that people would go door to door asking for food, drink or money to help them through the Christmas period. Got any apples, throw them down. Give me an apple and let me go. Up the stocking and down the show. Got no money, God bless you. So important were the cider orchards to the local economy that many traditions arose to ensure good growth, the most famous being the Wassail. This folk ceremony was usually carried out on Twelfth Night, which falls on 5 or 6 January in the ‘New’ calendar and 17 January in the ‘Old’ year. It involves cider, song, dance, fire and the discharge of shotguns into the fruit tree branches ‘to scare off evil spirits’. Wassailers, wearing mistletoe and bearing fiery torches, chose the best apple tree and placed a cider-soaked cake in the fork of the tree. Then they dipped a few branches in the cider pail, and poured the drink on the tree’s roots to ‘give back’ strength for the coming year’s growth. 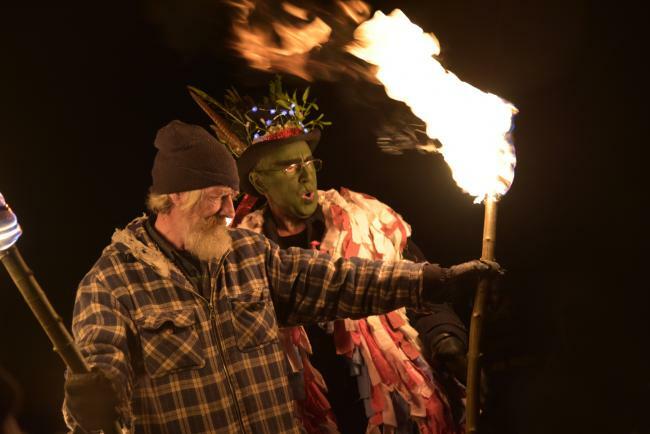 Our Herefordshire project partner, the Colwall Orchard Group, holds an annual Wassail. This film gives an excellent idea of goings on! To an elevated wheat field, there twelve small fires were lighted, and a large one in the centre, these fires generally… considered representative of our Saviour and the twelve apostles, though in some places they have the vulgar appellation of Old Meg and her daughters. Here’s to thee, old apple tree. And whence thou may’st bear apples enow. A chorus of obstreperous huzzahs follows…, and the whole party then return to the farmhouse, where a bountiful supper with libations of cider, the result of former wassailing, awaits them. That this observance is not yet given up in some secluded place is evident from what I have heard of an old farmer, who stated to a visitor that his neglect of wassailing one year caused the failure of his crop of apples. Jim Froggatt and David Spilsbury can remember farming near Rochford in the 1930s, so we asked them about how long the tradition lasted in the area. Neither Jim nor David could recall hearing of a wassail taking place or anything like it. We assume that wassailing must have fallen out of practice in this area just after the Great War, if not before.